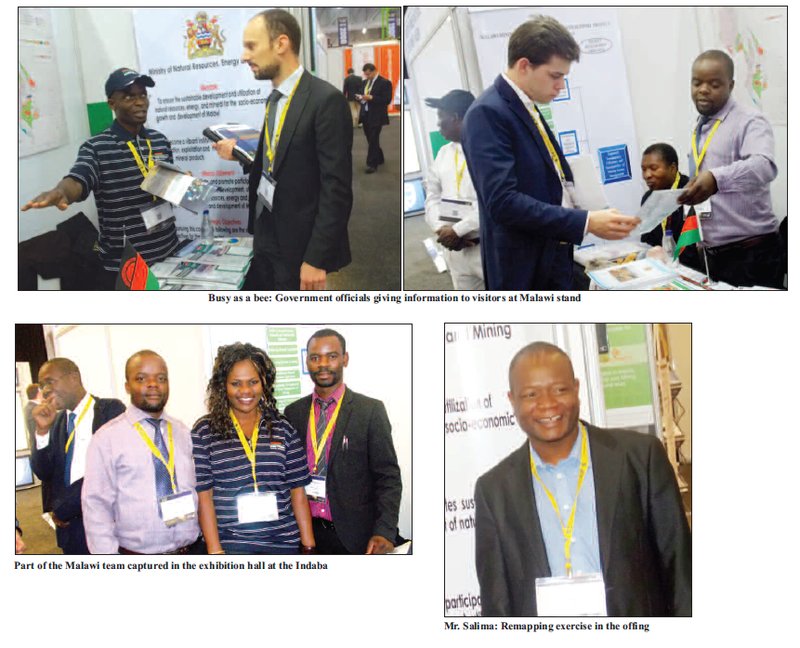 The piece “Malawi attracts investor interest at international mining indaba” featured below was initially published in Malawi’s Mining Review Issue Number 23 2015 that is circulating this March 2015. With its canals and the attractive Ocean waters, Cape Town is probably the most beautiful city in Africa. However, it was not the beauty of the city that swayed investors at the International Mining Indaba held in the resort city but rather the unique and exciting mineral potential of Malawi presented by the country’s Ministry of Natural Resources, Energy and Mining. Courtesy of the Mining Governance and Growth Support Project, which is financed by the World Bank’s International Development Association and the European Union, the Malawi team was fully equipped with information on Malawi’s untapped mineral potential in both raw and digital form that was provided to the inquisitive investors, many of them previously not aware of what this tiny Southern African country has to offer. In a report presented to the investors on the mineral potential of Malawi, Director for Mines Department Mr. Charles Kaphwiyo said the country has a rich and diverse mineral potential, which is largely exploited. Mr. Kaphwiyo told the investors that Malawi has, among others, unexploited mineral deposits associated with alkaline magnetism which include rare earth metals, coltan metals, nuclear metals and phosphate. Alkaline magnetism systems in Malawi are also important repositories of barite, fluorite, nepheline syenite,niobium, tantalum, thorium and zirconium, and may also be sources of copper, titanium, strontium, vermiculite and lateritic nickel. Kaphwiyo explained to the investors that Malawi is also endowed with mineral deposits associated with the basement metamorphic and igneous rocks, which include precious, and base metals, gemstones and industrial minerals. The Chimwadzulu Hill and Likudzi Ultramafic bodies in the Kirk Range in the Central District of Ntcheu are Malawi’s prime source of ruby corundum. Kaphwiyo said the Ministry of Natural Resources, Energy and Mining through the Geological Survey Department is also in the process of analyzing several nickel prospects in order to establish an economic deposit. The Director also reported that Malawi is investigating gold prospects in several places in the country notably Dwangwa in Nkhotakota District and Kirk Range in Ntcheu District in the Central Region of the country. Kaphwiyo said the other mineral deposits available in Malawi, which enterprising investors can follow up are those resulting from residual weathering, placer and rift related sedimentation which include bauxite, saprolitic nickel, gold and gemstone placers. He said a well known bauxite resource in Malawi occurs at Mulanje Mountain, which rises 600km-700km above the surrounding Phalombe Plain. The resource has been investigated by a number of companies including the Anglo American Corporation (1934), British Aluminum Company (1951-58), and Lonrho (1969-72). Lonrho showed that the two main deposits at the site hosts the resource amounting to 28.8-million tones using a cut-off grade of 30% Al2o3 with an average depth of 4.5 metres. Kaphwiyo reported that a feasibility study by Met-Chem Canada Inc. on the resource in 1993 estimated 25.6 metric tons of bauxite at a grade of 43.3% and proposed a mining output of 200,000 tons per annum alumina for an annual production of 100,000 tons aluminum. The Director told the investors that the other group of mineral resources found in Malawi is that associated with sedimentary and volcanic cover rocks; karoo and post karoo which include coal, uranium, industrial minerals and gemstones. reported the technocrat in the documents handed to the inquisitive investors. Meanwhile, the Ministry of Natural Resources, Energy and Mining has said that the results of its Airborne Geophysical Survey, which was conducted from September 2013 to August 2014, are expected to be released before the end of March this year. The survey was conducted under the Mining Governance and Growth Support Project supported by the World Bank and the European Union. It was flown by Sanders Geophysics Limited (GSL) of Ottawa, Canada and Quality control supervision was carried out by British Geological Survey international (BGSi). The survey was flown at 250m line spacing, 1km tie lines and 60m±20m ground clearance for Magnetic and radiometric while gravity was flown at 500m line spacing and 5km tie line. The current high resolution surveys followed the regional airborne geophysical survey that was funded by the United Nations Development Programme (UNDP) in 1984/85, and was flown by Hunting Geology and Geophysics Limited. The survey was flown with 1 km line spacing, 10 km tie lines and 120 m ground clearance, and the data set is available to interested clients. Acting Director of Geological Survey Department Jaff Salima told Mining Review in an interview at the Indaba that his department has kickstarted preparations for a remapping exercise which will be conducted as a follow up to the geo-physical survey. Salima said the remapping exercise to produce modern maps illustrating the geology of the country will be financed by the French Government. The theme of this year’s Mining Indaba was: Investing in African Mining and the keynote speaker was former British Prime Minister Tony Blair. In his address, Blair urged mining companies to take care of the communities in mining areas in addition to fulfilling their requirement, which is to make profits out of their ventures. Over the past 20 years, Mining Indaba has established itself as the must-attend event for professionals currently vested or looking to vest in attractive mining opportunities throughout all of Africa. See highlighted below. It is a typo, No?